Azurite is a soft stone, named for its deep “azure blue” color. It is a copper carbonate mineral found in the upper oxidized portions of copper ore formed in masses, nodules, tabular or prismatic crystals, sometimes with a vitreous luster. The saturated color ranges from bright to deep blue into shades of indigo, and may contain streaks of light blue. The blue of azurite is exceptionally deep and clear, and for that reason the mineral has tended to be associated since antiquity with the deep blue color of low-humidity desert and winter skies. The modern English name of the mineral reflects this association, since both azurite and azure are derived via Arabic from the Persian lazhward (لاژورد), an area known for its deposits of another deep blue stone, lapis lazuli (“stone of azure”). Azurite is a secondary mineral that usually forms when carbon-dioxide-laden waters descend into the Earth and react with subsurface copper ores. The carbonic acid of these waters dissolves small amounts of copper from the ore. The dissolved copper is transported with the water until it reaches a new geochemical environment. Azurite is one of the two basic copper(II) carbonate minerals, the other being bright green malachite. Simple copper carbonate (CuCO3) is not known to exist in nature. Azurite has the formula Cu3(CO3)2(OH)2, with the copper(II) cations linked to two different anions, carbonate and hydroxide. Small crystals of azurite can be produced by rapidly stirring a few drops of copper sulfate solution into a saturated solution of sodium carbonate and allowing the solution to stand overnight. Azurite precipitation occurs in pore spaces, fractures, and cavities of the subsurface rock. The resulting azurite is usually massive or nodular. In rare situations, azurite is found as stalactitic and botryoidal growths. Well-formed monoclinic crystals are infrequently found. These can only occur if azurite precipitates unrestricted in a fracture or cavity and is not disrupted by later crystallization or rock movements. The optical properties (color, intensity) of minerals such as azurite and malachite are characteristic of copper(II). Many coordination complexes of copper(II) exhibit similar colors. As explained within the context of ligand field theory, the colors result from low energy d-d transitions associated with the d9 metal center. 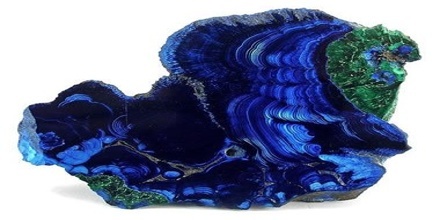 The most diagnostic property of azurite is it distinctive deep blue color. It is also soft with a Mohs hardness of only 3.5 to 4. It contains copper, which gives its blue color and a specific gravity of 3.7 to 3.9, which is exceptionally high for a non-metallic mineral. 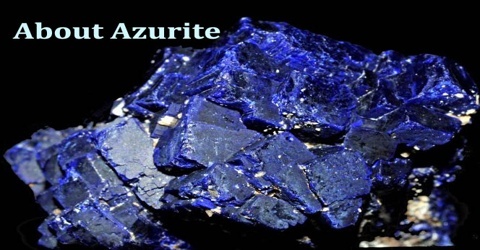 Azurite has been used as an ore of copper metal for thousands of years. The ancient Egyptians mined it on the Sinai Peninsula and smelted it to produce copper. Today, azurite deposits on their own are usually not large enough to be worth opening a copper mine. 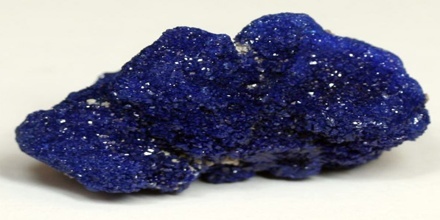 Azurite is used occasionally as beads and as jewelry, and also as an ornamental stone. However, its softness and tendency to lose its deep blue color as it weathers limit such uses. Heating destroys azurite easily, so all mounting of azurite specimens must be done at room temperature. The intense color of azurite makes it a popular collector’s stone. However, bright light, heat, and open air all tend to reduce the intensity of its color over time. To help preserve the deep blue color of a pristine azurite specimen, collectors should use a cool, dark, sealed storage environment similar to that of its original natural setting. 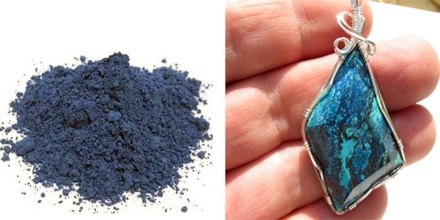 Azurite was ground and used as a pigment in blue paint as early as ancient Egypt. Through time, its use became much more common. During the Middle Ages and Renaissance, it was the most important blue pigment used in Europe. Much of the azurite used to make the pigment was mined in France.